Many of the service shops and technicians we talk to about vehicles using refrigerant 1234yf are only just starting to get requests for service help, in particular from body shops with vehicles involved in front end collisions. Some are gearing up though, primarily with hoses and quick connectors, an R-1234yf manifold gauge set and left-handed tank adapters; just enough to be able to evacuate and recharge a system using their shop’s existing scale and vacuum pump. Of course, they’re also purchasing their first cylinders of the gas, and while the number of suppliers continues to grow, pricing varies widely depending on who you’re dealing with. That’s about all that shops have really been doing thus far, as most yf vehicles have still been covered under their original factory warranties, and any required service has been taken care of by a dealer at little or no cost to the owner. Things are soon going to change however, as some of the earliest built vehicles start coming out of their warranty period, either by time or mileage. After all, we’re coming up on four years now since Cadillac began selling the first US vehicle to use HFO (hydrofluoroolefin), the 2013 XTS. And with a base warranty of 4 years / 50,000 miles, it’s likely the warranty period has expired on a few of these vehicles based on mileage alone. That’s good news for the aftermarket, as owners tend to bring their vehicles into our shops more often after the warranty runs out. But just because their odometers are going up doesn’t mean all the refrigerant is suddenly going to leak out. In fact, A/C systems have been built so well in recent years that we don’t expect them to need service due to refrigerant leaks for perhaps the first 6 years or more. It does however mean that independent shops need to prepare for the inevitable day when that first yf vehicle hits their bay in need of A/C service. And with SAE having recently completed the standard, now is the time to start checking out the new J3030 dual refrigerant R/R/R machines. yf is coming, but R-134a isn’t going away. 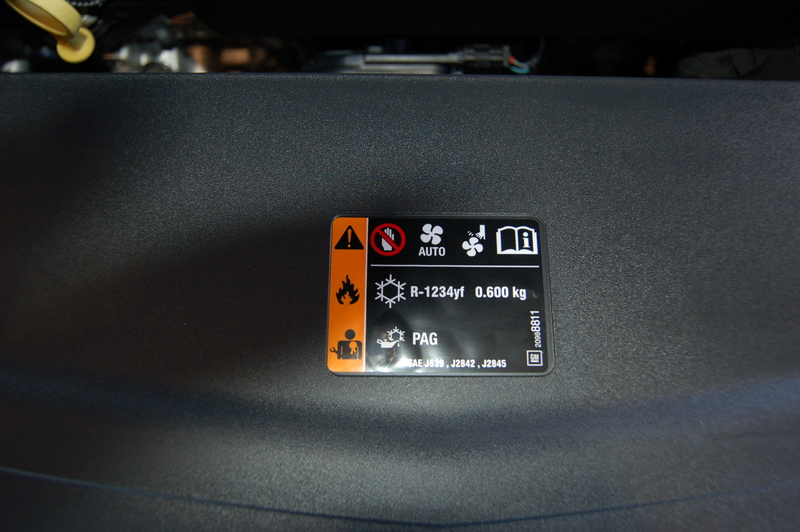 We follow the OEMs closely at MACS to learn about their vehicles that use R-1234yf refrigerant, which ones they’re installing it into, and what new designs they’ve come up with. Thus far there have only been a handful of examples we could refer to, but 2016 appears to be the beginning of a transition, as we’re seeing a few more car makers produce vehicles with the gas. In January we visited Team Toyota in Langhorne, PA to check out the first yf vehicle to hit their lots (which is also the first yf vehicle Toyota released in the US), a 2016 Tacoma SR5 pickup. You can see photos and read more about it on the MACS WordPress Blog by visiting https://goo.gl/roFy7u. If you’re a service professional and not a MACS member yet, you should be! Become a member and receive a technical newsletter with information like what you’ve just read in this blog post visit http://bit.ly/10zvMYg for more information. You can E-mail us at macsworldwide@macsw.org . To locate a Mobile Air Conditioning Society member repair shop in your area. Click here to find out more about your car’s mobile A/C and engine cooling system. This entry was posted in #1234yf, ACtion Magazine, Automotive, Automotive training, MACS Member, MACS Training Event, Mobile Air Conditioning, Refrigerants and tagged #MACS Member, #Macs worldwide, #MACSW, 1234yf, car, car care news service, car maintenance, mobile A/C training, mobile air conditioning, professional service. Bookmark the permalink.